England might have over two-thousand years of history, but most of that isn’t very visible in 2019. Travellers expecting a country of knights and castles might show up disappointed—most of the country (especially London and other city centres) reflects the past two centuries of industrial revolution. 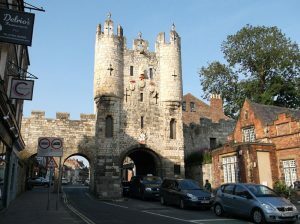 However, if you’re seeking a medieval fix, look no further than York. It skipped most of the industrial revolution, keeping its medieval feel. So take the train for the day and explore this very special northern staple. Here are the York must sees. Despite its modest size, York is one of England’s transportation hubs. It has a gorgeous train station and frequent trains between Edinburgh, London and Manchester. After that, it’s a short stroll into the historical centre. Like Bath and London, York started as one of the major Roman outposts on the island. After the Romans left England, the Vikings captured it and made it their central city. It spent much of the medieval era as England’s second city, a major centre of trade, arts and politics. It began to decline from the Tudor period on, with London’s increasing dominance, and missed the main industrial push with fellow northern cities Manchester and Liverpool taking precedence. 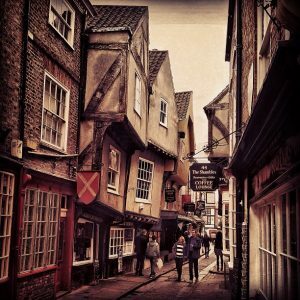 The narrow, inviting streets are best for wandering – take some time to approach York on your own terms. Walk through, get lost. York comes alive with personal exploration. Towering over York’s modest skyline even today, York Cathedral (or York Minster) is one of the most stunning Gothic cathedrals in the world, and almost certainly England’s best. It took over two-hundred years to complete. That history of care and devotion is chiselled into every detail in the walls, knave and pulpit. Take the narrow 275 steps up for premium views of the city. Stay for Evensong (6PM) to hear the earth-shaking organ in action. The largest rail museum in the world, this sprawling free-entry ode to Britain’s most important invention has over 250 original trains on display. Explore the intricate history of the rail, including its origins and how it changed the world, through stepping inside the trains. Highlights include the original Great Northern Railway steam locomotive and one of the first Japanese Shinkansen (bullet trains). For fun with the kids, take the £3 road train from York Cathedral. Discover what life in Viking-era York (pronounced Yor-vik) was like with this interactive retelling. Visitors take a ‘time car’ to travel into the past and watch re-enactments of the Vikings through colourful, detailed exhibits, excellent actors and (yes) robots. So grab your horned helmet and step on board! Remember to book tickets in advance though – this is York’s most popular attraction, by some measure. 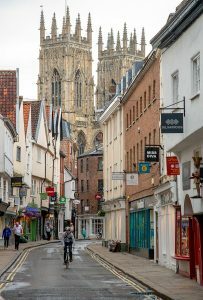 York might be small by today’s standards (although big enough at the time to get that city in America named after it). But it’s played a key role in English history, a history that’s etched into the cobbled streets, leaning shops, and sweeping Gothic architecture. Coming here is more than just a Yorkshire history lesson—it’s an intricate look at England’s past. That’s what makes the town itself one large must-see, however small it might be. And if you’re down south, make sure to check out Bath as well – and read our guide to it!